Enter Jason Chan. He is the senior illustrator and concept artist at Massive Black, a production company who spawns amazing illustrations, artwork and 3D work to some of the biggest names in the entertainment industry. Jason Chan is known for creating artwork for some of the most renown video games of all time. These include Dragon Age: Origins, Skyrim, Bioshock 2, Mass Effect 3, and Dead Space 2 just to name a few. 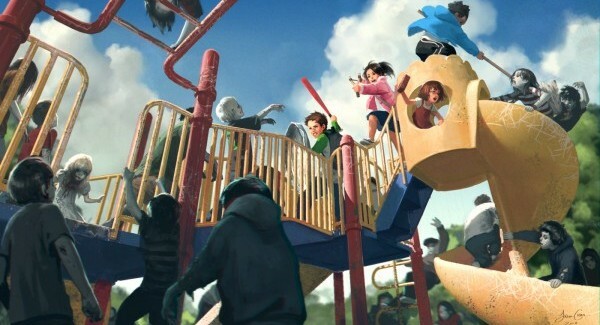 Recently, Chan created an image he called “Zombie Playground“. Zombie Playground was immediately a hit and received a lot of positive feedback. Now, Jason together with Massive Black, has created a Kickstarter campaign to launch the illustration from concept to full blow video game. For those of you who do not know what Kickstarter is, let’s take a quick detour and explore how Kickstarter works. Kickstarter is a way to make your ideas, dreams and wishes come true. It is also a way to share those same ideas with the community and ask them to get involved by pledging different amounts of money to invest in your idea. Most campaigns have different tiered pledge amounts, with different “rewards” you can obtain by pledging that amount. The campaigns have a set goal of money that they must reach in order for their project to be realized. Once their goal is reached, everyone who pledged money to kickstart the campaign will have their credit card charged and their rewards sent to them. Back to Zombie Playground: The game will surround a group of children in a post-apocalyptic world trying to survive. It will be an online, team based game with some RPG elements. You can build your character, learn new abilities and acquire new weapons. In order for this campaign to be successful, Chan and Co. must reach $100,000. Zombie Playground has only been on Kickstarter for a few days but already the campaign has managed to bring over $25,000! The campaign will run until June 27th 2012. If you want to pledge or you want some more information on how Zombie Playground will work, make sure you check out their website. To check out other illustrations by Jason, please be sure to check out Concept Art World.